The new year is a time to think about how to make your plant floor safer, more productive and cost effective. But that takes more than just basic machine maintenance. What about taking a fresh look at one of your biggest investments: your staff’s knowledge of machine safeguarding? To help out, Rockford Systems, LLC. is returning in 2019 with a machine safeguarding seminar schedule ideal for professionals in the EH&S, plant management, insurance and metal fabrication industries. From understanding how to properly safeguard machinery for meeting OSHA/ANSI standards, to a discussion on how to incorporate ergonomics into safeguarding methods, the educational seminars will give attendees practical, actionable ideas to take with them and put to use in their own operations. 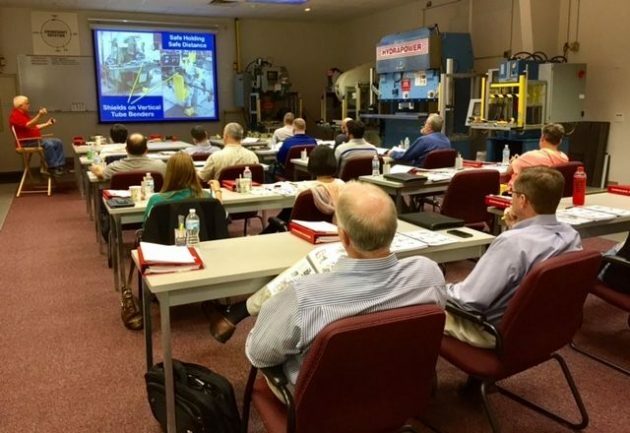 Considered the most comprehensive in the industry, Rockford Systems’ 2.5 day machine safeguarding seminars have been attended by thousands of professionals from aerospace, automotive, agriculture, consulting, government, insurance, manufacturing, metal fabrication, oil and gas, and many other sectors. The seminars’ primary focus is on interpretation of performance language found in both OSHA 29 CRF (Occupational Safety and Health Administration) and ANSI B-11 series (American National Standards Institute) standards, with specific safeguarding situations discussed such as basic risk reduction guidelines for metalworking machines as they relate to production requirements. Additional standards covered include ANSI/RIA R15.06 Safeguarding Industrial Robots, NFPA 79 and NFPA 70E (National Fire Protection Agency). Leaving the classroom for the plant floor, attendees will also witness a series of 15 safety demonstrations on lathes, power presses and press brakes so they can see firsthand how different guards and devices can be applied to prevent injuries and save lives. Seminars are led by Rockford Systems Director of Training, Roger Harrison, an industrial safeguarding expert with over 25,000 hours of training experience. Mr. Harrison is a regular speaker at training seminars sponsored by the Precision MetalForming Association (PMA), FABTECH, National Safety Council (NSC), American Association of Safety Professionals (ASSP) and more. Seminars are held at the new Rockford Systems headquarters at 5795 Logistics Parkway, Rockford, Ill.
Each person attending a seminar receives a variety of written materials for future reference and assistance in the safeguarding process. Seminars are scheduled each month in 2019 except for December, running 8:00 am to 5:00 pm the first two days and 8:00 am to 10:30 am on the third day.